Everything you need to know about how to watch Friday's first round games for the 2016 NCAA tournament. Want to know one of the best things about the first day of the tournament? We get to do it all again on Friday, just with 32 different teams. The SI.com viewer’s guide has all your needs covered for Friday’s 16 games, which start just after noon Eastern, and will not end until Friday has turned to Saturday on the East Coast. Dayton skidded down the stretch, losing four of its last eight games heading into the NCAA tournament, while the Orange surprisingly avoided the First Four. Syracuse senior forward Michael Gbinije (17.8 points per game) will be the best player on the floor here, and he'll be looking to help Syracuse avenge a 2014 round-of-32 loss to the Flyers. Villanova hasn’t made it to the second weekend of the tournament since reaching the Final Four in 2009. Whatever pressure the Wildcats feel from that drought isn't likely to be a factor against an Asheville team that lost six times in the tiny Big South conference. Behind senior guard Gary Payton II, the Beavers have made the NCAA tournament for the first time since 1990, when the Glove himself was starring in Corvallis. VCU may have the better record, but the Rams had just one win over an at-large team all season, while Oregon State had six. If the Golden Bears are going to fend off one of the nation's most popular upset picks, they’ll have to do it without senior guard Tyrone Wallace. Cal's leading scorer (15.3 points per game) and passer (4.4 assists) fractured a bone in his hand in practice on Wednesday and is likely out for the tournament. Hawaii’s Stefan Jankovic was the Big West player of the year after averaging 15.7 points and 6.6 rebounds per game. Michigan State may be a 2-seed but it enters the tournament as a national title favorite after having won the Big Ten tournament title. The Spartans kicks off their pursuit of a second straight Final Four berth with a game that shouldn’t give them much trouble. If the Blue Raiders have any hope of sticking with Denzel Valentine, Bryn Forbes and company, they’ll have to do so on the strength of their three point shooting, which at 38.9% ranks 18th-best in the country. At one point this season, Iowa looked like the class of the Big Ten, but it lost six of its last eight games and fell all the way to a No. 7 seed. Jarrod Uthoff and Peter Jok still present a dangerous 1-2 scoring punch that Temple, with a defense that ranks 51st in adjusted efficiency, will have to slow down. The Roadrunners may have rode their defense to the WAC title, but they never saw an offense like what the Sooners will present on Friday. Wooden Award favorite Buddy Hield and company should cruise into the second round. The Terrapins didn’t quite live up to expectations this season, though it's worth mentioning that they had just one bad loss all season (a five-point loss at Minnesota in mid-February). The Jackrabbits were Summit League's best team all season, and are led by standout freshman center Mike Daum (15.2 points, 6.1 rebounds). The Badgers may have flamed out against Nebraska in the Big Ten tournament, but they were previously one of the hottest teams in the country, winning 11 of their last 12 regular season games, with victories over Michigan State, Indiana, Maryland and Iowa included in that stretch. Pittsburgh ended up safely in the field, but had just two wins over at-large teams other than Syracuse this season. The Mountaineers are a legitimate Final Four threat, which they proved this season by beating Kansas and Oklahoma and sweeping both Iowa State and Baylor. The Lumberjacks dominated the Southland Conference for the second straight year, but in their one matchup with an at-large team, they lost to Baylor by 42 points. The Aggies enjoyed the program’s best season since the Acie Law days a decade ago, tying for first in the SEC regular season and heading into the NCAA tournament with legitimate Final Four potential. The chances of an upset here are slim, with Green Bay being a surprise champion in the Horizon after knocking off top-seeded Valparaiso. 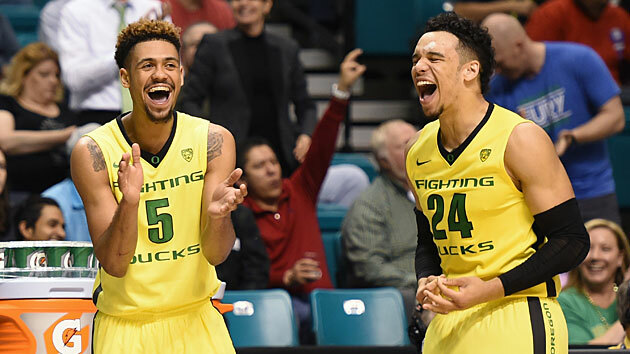 Behind Dillon Brooks, Elgin Cook and Tyler Dorsey, the Ducks turned into one of the best teams in the country and were a worthy No. 1 seed in the West. The Crusaders have enjoyed a dream run over the last two weeks, winning the Patriot League title and their First Four matchup with Southern, but their March story will almost certainly end on Friday. The Musketeers earned their lofty seeding this season, but it’s worth mentioning that they had just three top-25 wins on the year, a low total for a No. 2 seed. The Wildcats, meanwhile, boast an efficient offense, ranking 16th in the country in effective field goal percentage, but they turn it over a lot and are likely to have a long night on the backboards against Xavier. Michigan already has a win under its belt in this tournament, having beaten Tulsa in the First Four. If the Wolverines shoot closer to their season average from three-point range (38%) and less like they did against the Golden Hurricane (24%), they will be a threat to continue advancing. That could prove especially dangerous against a Notre Dame team—which has a strong offense in its own right—that ranked 313th in the country in three-point percentage allowed. Shaka Smart’s first year in Austin has already been an unmitigated success, as the Longhorns racked up six top-25 wins and finished in fourth place in a loaded Big 12. Northern Iowa, which reached the round of 32 last year, is more defense than offense this season, and that doesn’t appear to be the formula to hang with Texas. The Hawks surged into the tournament after upending George Washington, Dayton and VCUen route to the A-10 tournament title, with DeAndre Bembry putting the country on notice by averaging 20 points in those three games. The Bearcats have a star of their own in Troy Caupain, but they can fall into ugly scoring droughts, as evidenced by an effective field goal percentage that was just 214th in the country.